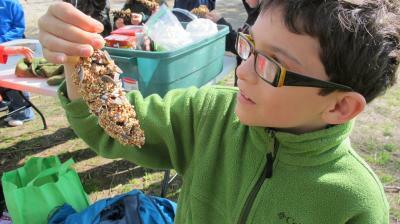 Erie elementary students learn science and art at Frontier Park. It's hard to remember today with the weather so miserable that last week was sunny and brisk, the perfect weather for hanging out in Frontier park with the entire second grade of Harding school to work on a science project. More specifically, to "Celebrate Urban Birds." Working with Cornell Labratory of Ornithology, Harding grade school students working with teachers and volunteers (me!) identified and counted birds in the park as part of a nation-wide urban bird study. They also read aloud bird poems they wrote for the outing; made suet feeders from pine cones, peanut butter, and seed; and helped plant bushes and shrubs near Cascade Creek by the green gazebo on the 6th Street side of Frontier Park. "Harding students take an annual field trip to Frontier Park to play," wrote outing organizer and Penn State Behrend professor Kim Todd, "but don't often learn about the plants and animals there. They often study ecosystems far from their daily experience--the rain forest, the ocean--but don't have knowledge of biological processes going on right outside their classroom doors." Students from Todd's Behrend creative writing classes worked with Harding students before the outing to craft bird poetry. At the park, the students conducted 10-minute observations in designated areas, noting the kind and number of birds they saw for the Cornell study. The event was a partnership between Harding School, the Lake Erie Arboretum at Frontier (LEAF), Greener Behrend, and Penn State Erie, the Behrend College. Volunteers from those organizations participated and led the activities with the children. territory, build nests, and raise young," wrote Todd, "deepening the students' understanding of biology and ecology and the communities in which they live....The citizen science aspect--the fact that student observations will contribute to a larger project with real-world implications--will be particularly attractive to second graders and get them excited about science." Todd hopes to repeat the project on an annual basis.